Yuehe Lin was named to the Thomson Reuters Highly Cited Researchers 2015 for Chemistry. Dr. Yuehe Lin, who holds a joint appointment at Washington State University and Pacific Northwest National Laboratory, was named to the prestigious Thomson Reuters Highly Cited Researchers 2015 for Chemistry. He joins five others at the national lab who received this honor. The list, released annually, is a worldwide compilation of scientists and social scientists whose study citations rank in the top 1 percent in 21 different fields. The compilation of names, more than 3,000 in 2015, is one measure of the world's most impactful and influential scientific minds. The 2015 rankings are derived from InCites, a Thomson Reuters tool that combs through a database of indexed published papers from 2003 to 2013. 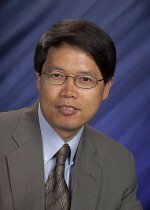 In his joint appointment, Lin is a full professor at Washington State University and a Laboratory Fellow at PNNL. At both institutions, he leads nanoscience and nanotechnology research that is devising new ways to speed drug delivery and disease diagnosis, reducing the pain and frustration of determining toxin exposures. Further, he is creating novel nanomaterials for environmental and energy devices, including fuel cells and batteries. Lin's work has proven popular with the scientific community. He has written or co-written nearly 360 articles and publications, which have earned ~28,600 total citations with h-index 88. He is the editor of the Handbook of Electrochemical Nanotechnology and one of the section editors of Encyclopedia of Microfluidics and Nanofluidics. He also serves as the associate editor for the Journal of Nanoscience and Nanotechnology and is a member of 20 editorial advisory boards. His work has earned more than 10 patents, half of which have been licensed to industrial partners for commercialization. Lin is a fellow of the American Association for the Advancement of Science, Royal Society of Chemistry, and American Institute of Medical and Biological Engineering.